The Beautiful Tree from James Tooley provides a powerful antidote to the one-sided focus on public education as the only route towards universal education. Tooley uses historical and geographical arguments to illustrate that public schools are not the only way to educate children. Public schools were introd uced by nation states as an instrument to exert more control over education and ‘building society’. Motives for education have evolved from instilling democracy to preparing an industrial workforce. Standardized education systems with grades, curricula and exams are a reflection of an industrial society. Before the introduction of schools, however, alternative education systems were in place based on community learning and apprenticeship, such as the Madras method with older students teaching younger ones. Jean Lave described such forms of learning in developing countries, which formed the base for his concept of ‘Communities of Practice’. 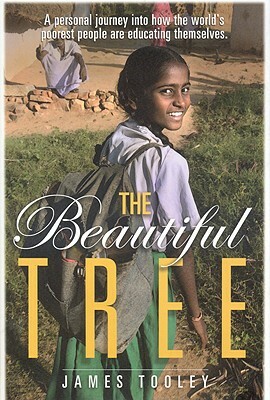 The title of the book refers to a quote from Gandhi, in which he refers to the introduction of standardized, school-based education by the British colonialists, who claimed that no education system was in place, as the ‘uprooting of a beautiful tree’. Neither is public education the only game in town in developing countries. Tooley describes numerous private schools in slums and poor neighbourhoods, charging parents around 5$ per month. But why would parents pay for education if free public education is available? Tooley presents research showing that low-cost private schools in poor regions often do a better job in educating the poor than public schools. There are different reasons for this. The main one is direct accountability, creating clear incentives to provide quality education. Directors in private schools are under pressure from parents to recruit and train teachers well and to control them. Teachers are under pressure to perform as parents want value for money and check on their children’s learning. Directors have more flexibility to reward and lay off teachers. In public education, accountability is much lower and indirect, through elections and bureaucratic monitoring systems. The result is rampant absenteeism and low motivation. Tooley quotes Kenyan figures of 30% absenteeism (about 1 chance in 3 that an unexpected visit finds that a scheduled lesson is not going on), and I think Cambodian figures could well be in the same order. In Cambodia, many public school teachers double up as teachers in private schools, adhering more importance to the latter. Private schools charge fees to poor parents. This might seem immoral at first sight, but Tooley dismisses the image of private schools directors as heartless capitalists. Most schools waive fees for the poorest. Public education is free in name only. Informal (uniforms, books, exam fees) and hidden (obligations to take additional tutoring, ‘contributions’ for exams) fees make public education often quite expensive. Public schools tend to be bigger and less concentrated in poor neighbourhoods than private schools, as they need scaling to cover for higher teacher and administration salary costs. Finally, as Tooley and Duflo and Banerjee argue, people, even poor people, are willing to pay for education, provided they get value for their money. Data on the number of poor people choosing to send their children to private schools, despite so-called free public education, are quite staggering. In Cambodia private schools are popping up everywhere, many charging 5 to 10 dollars a month, an amount feasible for many Cambodians. Many seem more interested in quality education, rather than free education. Tooley blames development partners in putting all focus on achieving ‘free public education for all’, crowding out local entrepreneurship with donor money and neglecting quality and accountability. Parents preferring private education are dismissed as ‘ignoramuses’ (quoting Oxfam), who don’t know what’s good for them. Instead of propping up inefficient government systems, he advocates helping educational ‘searchers’ (a term from Easterly) through legal support and micro-finance Targeted vouchers for poor students are more efficient than subsidising everyone. He advocates ‘brand’ development to help parents identify quality, similarly to the brand McDonalds guarantees a certain ‘quality’ of hamburger (hmm, perhaps not the best example). It’s a thought-provoking book, questioning many strategies we apply in Cambodia. Inefficiencies in the government system (low salaries, low teacher motivation, low accountability, corruption…) are considered as ‘external’ assumptions and mostly ignored. Donors cooperate with governments and supporting private schools would actively undermine the government’s own education system. Western approaches to schooling and education are unquestioningly transferred to developing countries. Private initiatives to education are condemned as ‘antisocial’ and ‘low quality’. I recommend Tooley’s book as it challenged assumptions about the role of the state and the school in education, not only in developing countries. Notwithstanding a remarkable recovery in Cambodian education in the last decade, access for disabled learners has lagged behind. Accessibility goes beyond the availability of computers and teaching resources. Barriers to education for disabled students start with barriers in society. Large pupil:teacher ratios and small classrooms reduce accessibility. Instruments for diagnosis are not in place and, as a result, students with learning difficulties or ‘invisible’ disabilities such as dyslexia or mental impairments often end up being labelled as stupid and drop out. The education system is strongly centralized with a rigid curriculum and inflexible learning outcomes that emphasize academic achievement, as opposed to all-round development. As a result, teachers are less flexible and pay less attention to individual learning needs. Local NGOs tend to establish special schools, rather than develop integrated programs. Assistive technologies they introduce may not be scalable and render learners dependent on technologies that their families or future employers cannot afford. The pre-existence of a segregated education system makes it more difficult to achieve inclusive education later. Unfortunately, activities of specialized NGOs give other organisations an excuse not to focus on disabled learners, sustaining an old-fashioned, medical approach to disabilities. There are socio-economic barriers as well. Many Cambodian parents decide not to send their disabled children to school. They consider education primarily as a way to acquire wealth and wrongly believe that the first few years of education matter less than the next ones. As a consequence, they tend to invest all their resources in the education of one child, rather than in an equitable education for all their children. Moreover, employment opportunities are scarce as employers are not encouraged to hire disabled people. Until 2008 disabled people in Cambodia were even excluded from teaching. This is enhanced by social discrimination. Buddhist culture considers a disability as bad karma and a punishment for faults committed in a previous life (Krousar Thmey 2010 Annual Report). This leads to social discrimination and instils a sense of complacency in disabled people and their environment. Online education in general still faces tough cultural challenges. Online learning is often considered as second-rate education in a society where education is traditionally associated with teacher instruction and memorisation. Positive role models are important in changing attitudes and behaviour, as well as systems of quality assurance for online education. In 2012 the Cambodian National Assembly decided to ratify the United Nations Convention on the Rights of Persons with Disabilities (UNCRPD). As the Convention enters into force on 19 January 2013, it will legally bind the government to work on inclusive education. Ratification fuels expectations that the Cambodian government will adopt a social and universal approach to disabilities, in alignment with the WHO’s position. Developing course and materials with accessibility and flexibility in mind benefit all learners, as these cater to a variety in learning styles, learning speeds and impairments. Disabled learners may benefit from more online learning as they can study at their own pace at home. Digital learning materials are usually more flexible as font sizes and types, background colours and format can be changed and assistive technologies used. Online learning allows more control on communication and disclosure. However, online learning may also increase barriers, due to badly designed software and learning materials, or due to a lack of personal support. In Cambodia ‘blended’ approaches with supporting regional centres, located in schools or centres for teacher education, that complement online activities and function as places for tutor assistance and peer support, could be explored. A model applied for some time, among others, in Brazil. Online learning would expand educational opportunities for people outside the capital, deploy scarce human resources more efficiently and allow teachers to follow in-service training without having to leave their schools. The Teacher Education in Sub-Saharan Africa (TESSA) programme is a good example of contextualising online learning to teacher education in developing countries. Changes in legislation do not automatically lead to improvements in accessibility. The government needs to invest in human capital for specialised support services and make assistive technology more widely available, for example through loan kits. Principles of universal design and awareness of disabilities should be embedded in general teacher education. Most importantly, disabled people need to be convinced that they as well can have dreams and aspirations, and that they can achieve them as well, with the right support. 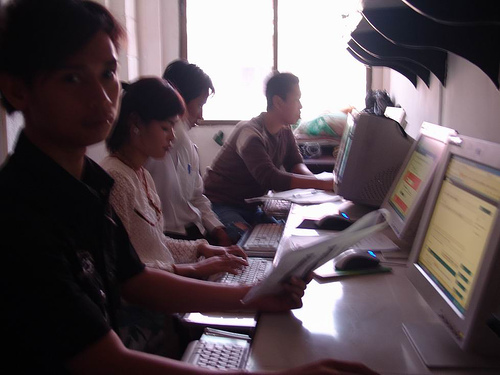 Online learning can contribute to an inclusive learning environment by providing a platform for creating and sharing accessible learning materials, creating opportunities for scaling up pre-service and in-service teacher education, allowing learners to study in a more flexible way and opening up access to international courses. The frequency of posts on this blog has been rather limited during the last few months. This is largely due to H810, Accessible Online Learning, at the UK Open University. By submitting my end paper (EMA), my third module on my way to a Master in Online and Distance Education is now officially finished (although results won’t be in for a few months). I posted impressions on previous modules, H800 and H807, before. Each module follows a broadly similar structure, based on carefully crafted course texts, academic and website readings, asynchronous discussions with peers and tutors in the forum and regular flurries of activity ahead of paper deadlines. In these papers, learners need to relate course content to their own context. H810 was not different from other modules. The relative balance in quality does vary though and some aspects were different. This module was the most practically oriented so far. All kinds of tools and software passed under the spotlight. Standards and their practical translation into guidelines were discussed. Developing and assessing learning resources was an important part in the assessment. The weight of academic papers was lower than in previous modules. Instead we looked at more videos and websites. The academic character was more than compensated though in the last block of the course, that focused on interpreting accessibility in education through three models (Institutional Change, Activity Theory, Communities of Practice), taking a more policy and institutional stance. In particular institutional change (North, 1994), which discusses the difference between theory (issuing rules) and practice (lack of change on the ground) formed a welcome policy viewpoint complementary to the operational focus in the first half of the course. Tutor support was not so much strong in quantity (fewer supporting messages in every discussion) as in quality (other viewpoints, pointers to supplementary resources, useful tips), which I appreciated. I found the quality of peer discussion very high, as most learners had a professional role in supporting disabled learners in higher education. For me, without experience ‘in the field’, these discussion offered a welcome addition and reality check to the academic materials. No course is perfect though and there were some glitches. There was little attention for accessibility development outside the Anglo-Saxon world. There were no synchronous discussions, except for one tutor-led presentation on Xerte Online Toolkits, which I liked very much. In H800 these discussions helped to create a group bond and although tutor group discussions were lively, I can’t say there was a strong community feeling. I found the time available for writing the EMA (a 6000 words essay) extremely short, in particular as the deadline was right after Christmas holidays. A short break sometime in course activities would have been fine. But overall I found H810 an extremely interesting course, partly because I had very little prior knowledge. It definitely raised my awareness for accessibility issues in (online) learning. Concepts such as a social view on disability, invisible disabilities and universal design are relevant for development cooperation as well. The course strengthened my belief in online learning, and made me looking forward to my next module, H809 (although I’d love it would start a few weeks later). 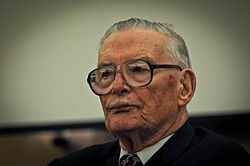 The American economist and Nobel Prize winner James Buchanan recently passed away. Some quotes and information about his work were posted on MRU. A concept, first described by him, the Samaritan’s Dilemma, is particularly relevant in development cooperation. The prospect of bank bail-outs is an example where money (from tax payers) to banks (the recipients) has reduced incentives for these banks to work efficiently and lower risks. In development assistance recipient governments know that donors will provide money, whether they extent low or high effort. They will have therefore fewer incentives to create strong institutions, policies and rules. They may even have adverse initiatives: the worse the performance, the more development aid they will receive. This is real. During workshops participants pretend to have a lot of problems using teaching resources, later admitting that they hope to receive more training (and per diems). The Samaritan’s Dilemma reduces accountability, as recipients don’t face the economic consequences of their actions (donors pick up the tab anyway). When repeated (often the case in development assistance) the donor may create a situation where the recipient loses skills and motivation over time. The Samaritan’s Dilemma is primarily a motivation problem, but a lack of or asymmetric information creates similar problems, such as moral hazards. This is a situation where people receiving indiscriminate amounts of donor funds will be less inclined to engage in reforms or find alternative revenue sources. Solutions to the Dilemma lie in capacity development and ownership by recipients. Capacity development intends to strengthen recipients’ knowledge, skills and attitude to undertake certain activities, e.g. teach in a different way. Ideally, capacity development is coupled to a clear timeline, allowing recipients to gradually take responsibility for the actions. The problem with capacity development is that recipients do not always have the incentives to invest in the knowledge and skills that the donor is trying to develop. These incentives are determined by rules and institutions at higher (policy and constitutional) level. Ownership is a buzzword in development cooperation and worth of a (soon to write) blog post in itself. * The picture of James Buchanan is published under a Creative Commons Attribution-Share Alike 3.0 Unported license.